The white wine variety Zierfandler (not to be confused with the Californian Zinfandel) is considered a natural crossing between Roter Veltliner and a relative of Traminer (Savagnin). It is practically found only in the Thermenregion where it is cultivated on 72 hectares (178 acres), comprising 3.3 % of the region’s vineyard area (statistic 2016). Zierfandler was once also widespread in Hungary in the lowland plain south of Budapest to the border of Serbia and Romania and was also know in the South Banat district of Serbia. Zierfandler was historically also marketed as a blend with Rotgipfler. The synonym “Spätrot” translates to “late red” and refers to the reddish colour that occurs at the height of ripeness on the side of grape bunches that is exposed to the sun. 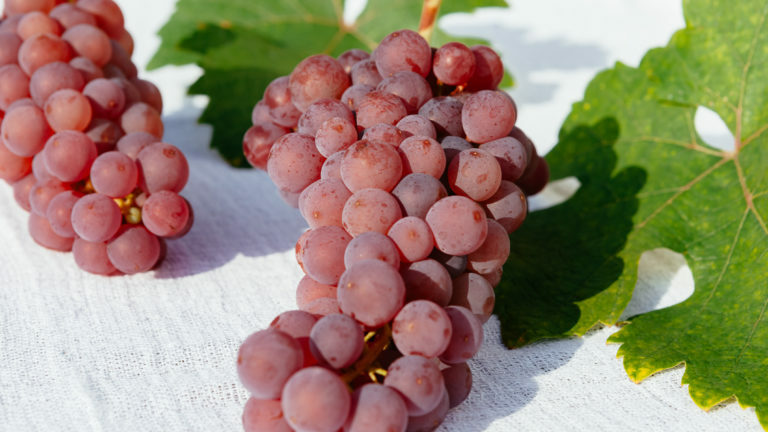 Zierfandler grape bunches have a cylindrical shape and either no wing or a medium large wing. Leaves have five to seven lobes and the base of the stem is red. Budbreak of Zierfandler is late, while flowering occurs within the average period. Harvest takes place between mid and late October, usually around 14 days after Rotgipfler. Zierfandler requires best sites with light soils, since it is sensitive to frost and susceptible to botrytis. A further essential parameter is a south-facing aspect. The calcareous soils and specific Thermenregion climate with hot and dry summers and usually a dry autumn suit this variety well. Zierfandler wines tend to be rich in extract and possess good acid structure and generally a harmonious balance between acidity and richness. The best results are usually achieved when grapes are harvested with high must sugar weights. Wines exhibit aromas of pale fruit reminiscent of pineapple and citrus in their youth. As they mature, notes of dried fruit and meadow blossoms appear.